Not being limited to any particular industry or field, Kinematic Events has a broad range of expertise which can be adapted to provide the best of all sectors and bringing them together in one smart package. With experience in hospitality, engineering, technology and public relations, KE has it all to offer. We get involved in all aspects of businesses and events. Most people forget about the logistical nightmare that has to take place backstage when organising an event, running a restaurant or any hospitality. We use business process methods and technology to take the stress out of the organising, leaving you with more time and resources to improve business performance and enjoy the event fully. Many years ago, there were a number of TV shows about such as BattleBots ® and Robot Wars ®. It took the world by storm with these fighting machines battling it out in an arena. There are still many 'roboteers' (people who battle these robots) that are still touring around the UK and building new machines to take part in competitions. 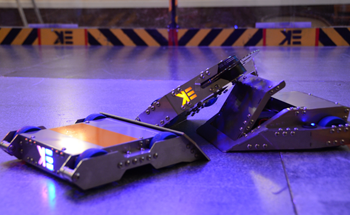 One of our directors used to take part in the original TV Series Robot Wars ® with the robot Pussycat, which won the All Star Championships in Series 7. After competing in the show, he worked with different touring versions of the show around Europe visiting leisure centres and holiday parks. Kinematic Events has built their own smaller battle arena and a fleet of battle robots for kids and big kids alike, to take control of and have their own wars in the arena! 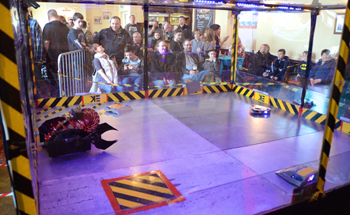 This smaller touring robotic combat spectacle will be featuring around pubs, activity centres and more. It will also be available for hire for team building days and birthdays etc. Check out our Robot Page for more information. We are currently trialling our Restaurant Table Management System at a high profile pub and restaurant chain. Initial results from our system seem very positive, allowing a restaurant's host to know instantly which tables are available to seat new parties down for their meal. The host and kitchen staff can also check the status of each table such as what course they are eating, how long they have been at the table etc. This in turn frees up other members of staff to concentrate in providing a great service. The extra feature to this system is it will provide the company with statistics of the night allowing a business to analyses and digest to improve service for next time. The system runs on a central database server, which then with the use of secure logins and passwords, staff can sign into the system on any wireless device, such as an iPad at the host's stand, or a manager out and about checking on their phone to see how busy the restaurant is. Want to see a trial run or interested in implementing this low cost but high value system at your business, drops us a line from our contact page. Please feel free to contact us with your suggestions or requirements and find out what Kinematic Events can do to boost your performance, efficiency and enjoyment!